Perugia, the great "Guelf strong-hold" rises up in the region's heart, with its 5 storical quarters closed-in by its Etruscan town walls. These enormous bastions formed by cyclopic square masses, were constructed 22 centuries ago and are still visible for long stretches. When the city of Rome was little more that an encampment of huts, one could already enter the etruscan Perugia Italy using one of 7 portals, among which one was particularly mighty, the Porta Pulchra or of Augustus, dating back to Etruscan times. Entering the city via Porta San Pietro, whose exterior was remodelled by Agostino di Duccio in 1475, you'll arrive at the basilica of St. Dominic on the right-hand side; the very important National Archeological Museum of Umbria is to be found in the adjacent cloisters and convent. Continuing along, you'll reach the Piazza del Sopramuro, where the 15th century Palace of the Old University and the adjacent Palace of the People's Captain look down on the square. Further on, after a short climb, you'll find yourself in one of Italy's most important squares, where you'll see the Priors' Palace, the Cathedral and the 13th century fountain Major Fountain at the center. 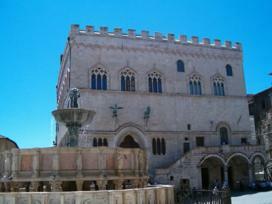 These monuments render the Piazza Grande of Perugia (now called Piazza IV Novembre) a superb architectural complex. At the extreme end of Corso Vannucci you'll find famous panoramic gardens built on the foundations of the Rocca Paolina, a strong-hold built by Pope Paul III in 1540. These foundations contain, similar to under an enormous bell, an entire quarter of the old Perugia: a dead city, a sort of Medieval Pompei which has been brought tot light again and which is fascinating to visit. Perugia's ascents and stairways are usually quite steep, both the most ancient and the most recent. The way Via delle Prome is a typical example. Leaving from the Augustus Arc, this way lead to the upper point of Perugia, where used to be the castle of Porta Sole, erected in the XIV century by the dal Gattapone, and destroyed later for willing of the whole town people. A short visit in Perugia is definetly interesting, but is a longer visit which will reveal all the atistic jewels in detail. Even if you are on a short visit, you should not miss the archtectural complex of St. Francesco, with the Oratory of St. Bernardino, a masterpiece of Agostino di Duccio, who, in covering the facade with bas-reliefs of enchanting grace and modelled fineness made it a little poem of Renaissance sculpture. 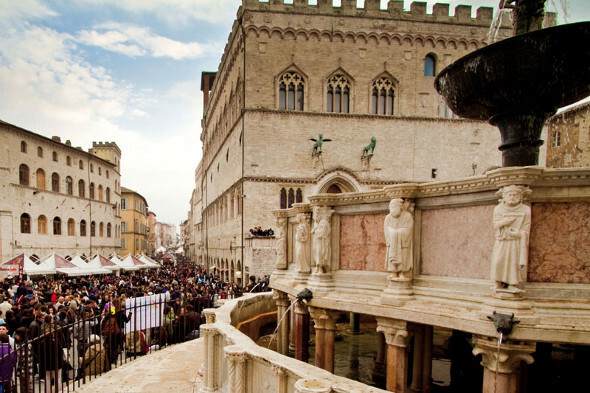 Among the most important manifestations taking place in the city we should absolutely mention the musical festival Umbria Jazz and the gastronomic festival Eurochocolate. To Remember, too, in Perugia, especially for children is the Città della Domenica, first amusement park of Italy!